Panoramic view of Umeerapoora. Looking N.W. bl.uk > Online Gallery Home	> Online exhibitions	> Asia, Pacific and Africa Collections	> Panoramic view of Umeerapoora. Looking N.W. 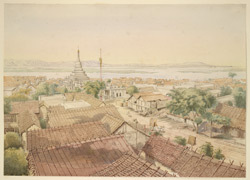 Watercolour in pen and ink of a panoramic view of Amarapura looking towards the north-west from 'A Series of Views in Burmah taken during Major Phayre’s Mission to the Court of Ava in 1855' by Colesworthy Grant. This album consists of 106 landscapes and portraits of Burmese and Europeans documenting the British embassy to the Burmese King, Mindon Min (r.1853-1878).